Bulkheads and rip rap that line the shores of Lakes Washington and Sammamish have greatly reduced essential habitat for juvenile Chinook salmon. WRIA 8 and its partners encourage homeowners to “soften” their shorelines by replacing bulkheads with beaches and native plants. WRIA 8 sponsored green shorelines workshops in 2009 and sends periodic mailings to educate lakeshore property owners about salmon-friendly shoreline practices. WRIA 8 also developed a Green Shorelines website with shoreline restoration resources and a map of publicly accessible demonstration projects. Organizing at a watershed scale to plan and implement salmon recovery provides many benefits. First and foremost, the WRIA 8 partnership is a forum for shared decision-making, and the WRIA 8 Plan provides a shared salmon recovery vision. The WRIA 8 partnership has proven an effective and efficient way for local governments to address the ESA listing of Chinook salmon collectively and has engendered an understanding among partners that all communities in the watershed benefit from implementing the highest priority salmon recovery actions. Guided by hypotheses in the WRIA 8 Plan, WRIA 8 has supported project sponsors in developing project concepts and strategies to secure funding. This watershed vision also helps integrate other priority regional efforts, like floodplain management, water quality improvement, shoreline and riparian area stewardship, invasive weed control, and operational improvements to the Hiram M. Chittenden (Ballard) Locks. WRIA 8 has had great success working through partnerships to advance restoration and stewardship priorities, and partnerships have enabled several existing programs to continue and new programs to develop. In particular, non-profit and local government partnerships have helped advance WRIA 8's priority focus on riparian area restoration and stewardship in the Cedar River and Issaquah Creek basins. 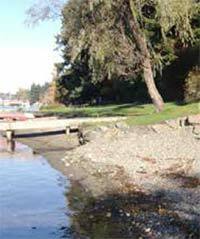 Creating a partnership between regulatory agencies, local governments, and non-profit groups also enabled WRIA 8 to more effectively promote softshore alternatives to bulkheads and other shoreline armoring around Lake Washington and Lake Sammamish. Recognizing the limited dollars available for salmon recovery, WRIA 8 partners have worked to improve coordination across programs and develop projects that bring multiple benefits. For example, a habitat restoration project may also support flood risk reduction, water quality, and recreation objectives. Similarly, a project to remove or replace a culvert can meet salmon restoration and flood risk reduction goals. The state legislature and other funding sources are increasingly showing a preference for multi-benefit projects. Identifying opportunities to integrate salmon recovery with other complementary objectives will be an important strategy for salmon recovery into the future.